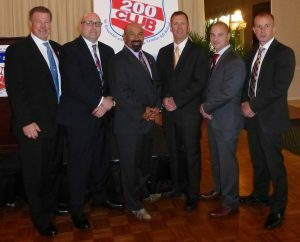 The 210 guests at the 200 Club of Mercer County’s Annual Luncheon on Wednesday, June 13, were eager to convene for thousands of reasons – the acts of valor carried out 365 days per year by Mercer County’s public safety and rescue personnel. The mission of those attending the lunch at the Stone Terrace in Hamilton Square, however, had only one goal – to pay tribute to 13 law enforcement officers being honored for their bravery, skills, character, determination, and unwavering commitment to the health and well being of the county’s citizens. The 200 Club of Mercer County, which costs $200 to join for membership, was founded nearly 40 years ago to provide financial assistance to the families of public safety and rescue personnel who have lost their lives in the line of duty. This includes the police officers (state, county, and municipal), fire fighters, rescue squad technicians and corrections officers of Mercer County. Crucial to its mission is the celebration of those first responders who have exhibited extraordinary courage and bravery under difficult or hazardous conditions. The 2018 Valor Award presentations went to: Trenton Police Officer Freddy Jimenez; NJ State Police Detective Rasheed Joaquin; NJ State Police Sergeant Curtis Sand; NJ State Police Lieutenant Tom Wieczerak; New Jersey State Police Sergeant Joe Itri; Princeton Police Detective Adam Basatemur; and Princeton Police Detective Sergeant Benjamin Gering. Their “valor” stories were different, but similar in that all the officers put themselves in grave danger for the public good. In two instances, officers, under very dangerous circumstances, pulled to safety individuals trying to commit suicide. 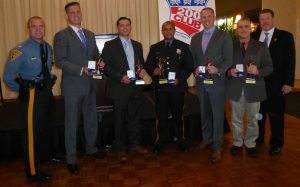 In addition to the Valor Awards, the 200 Club presented a Special Recognition Award to the six officers of the Mercer County Task Force, who met gunfire, when they attempted to serve an arrest warrant – a situation that led to a dramatic and life-threatening 36-hour standoff. The officers involved were: Mercer County Prosecutor’s Office Detective Anthony Abarno; Sheriff’s Detectives William Perez, Joseph Tuccillo and Steven Niederer; NJ State Parole Board Officers Timothy Healy and Barry Volkert.